Why do 38 million Americans have chronic sinus infections? (NaturalNews) We're all familiar with the symptoms: watery eyes, sinus pressure, headache and that insanely annoying runny and itchy nose. While most of us spend at least one season suffering from allergies, others have chronic sinus infections that never seem to cease. So what gives? It certainly doesn't seem natural to be constantly combating sinus complications. According to authors Debra Fulghum Bruce and Murray Grossan, M.D., chronic sinus infections aren't exactly natural, but they sure are common. An estimated 38 million Americans suffer from sinusitis or chronic inflammation of the facial cavities, including around the nose, cheeks and eyes. The Sinus Cure: 7 Simple Steps to Relieve Sinusitis and Other Ear, Nose, and Throat Conditions, explores alternative and complementary methods for healing and alleviating sinus pain. These include exercises such as yoga and tai chi, as well as nutritional supplements. The book also identifies foods that trigger and reduce sinus problems. Chronic sinusitis is the most prevalent "adult disease" in the United States, with more than 38 million sufferers. Noxious smoke and deleterious fumes and chemicals work to bring on sinusitis. With an increase in population along with this increase in pollution and drug-resistant bacteria, the number of people who suffer with sinus problems continues to skyrocket. From coughing all night because of the continuous, thick post-nasal drip running down the back of your throat to a throbbing earache because of trapped fluid to the excruciating pain of pounding headaches to chronic hoarseness from clearing your throat repeatedly, sinus discomfort is all too familiar to millions. Not only can your sinuses affect tissue in your teeth, face, and jaw, causing excruciating pain, but they can also trigger an all-out asthma attack. Did you know that more than 50 percent of all asthmatics also suffer from chronic sinusitis at some point, which can make asthma symptoms flare up and worsen? Hydrotherapy - is the use of water in all forms, from ice to steam, to promote healing. This complementary treatment works by stimulating your body's own healing force. Cold compresses reduce swelling by constricting blood vessels and helping to control minor internal bleeding. This is an excellent way to stop a nose- bleed associated with sinusitis. Conversely, moist heating pads or warm, moist compresses on the sinus area can reduce the soreness and pain by increasing blood flow in and drainage out on effective hands-on treatment for sinus headache pain or congestion. Moist Heat - Many sinus sufferers find excellent relief from clogged nasal passages and headache when they use twice-daily applications of moist heat. This is simple and inexpensive to do, yet the benefits are great. Not only will your sinus pain subside, but you will also help to increase drainage and blood flow to the sinus area. Hot/Cold Contrast Therapy - Alternate hot and cold applications on the sinus area. Using a damp cloth, alternate two minutes hot with one minute cold. Repeat four times, three times each day to reduce congestion and open the sinus area. Water to Liquefy Thick Mucus - Drink tepid (room-temperature) water and a lot of it. Just don't drink cold or iced water, as it stops the cilia from functioning normally. Water keeps your respiratory system hydrated, which helps to liquefy thick mucus that builds up to cause infection in your sinus cavity. Some experts recommend drinking as much as twelve to fifteen glasses of fresh water daily, or even more. Keep a tall glass of water on your desk or pack a few extra bottles of water for work or recreation. Other liquids can also be added, but don't depend on coffee, tea, or alcoholic beverages to make this goal. These liquids dehydrate the body of its water stores, leaving you needing even more water. In fact, those who are allergic to red wine, sulfites, yeast, or other components of alcohol face double trouble when they drink. Not only do they literally "dry up" from dehydration, but they also experience increased nasal allergies from ingestion. Natural Aromatic Relief - A natural product available at most health food stores is Tiger Balm. This ancient oriental remedy is filled with potent aromatic herbal extracts menthol from peppermint, eugenol from cloves, cineole from cajeput (similar to tea tree), cinnamon, and camphor. Tiger Balm is rubbed into the sinus area, and some people claim it clears the sinuses instantly. 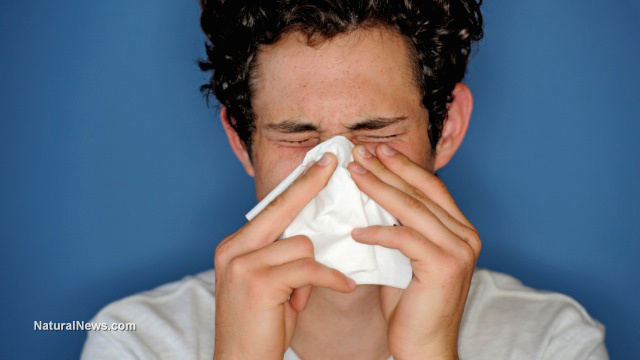 Health Basics: Why do most antihistamines (prescribed and over-the-counter) eventually cause sinus infections?